We were recently discussing countertops with a builder who asked us which type of material we would recommend. When we emphatically responded, "quartz" he was shocked. Is it really that great for the price? The answer is yes! We love quartz. It's got a huge variety of color options and styles, is highly durable, and is actually relatively competitively priced. It also comes in multiple thicknesses so you don't have to pay for the thickest quartz and you can still get the functionality of it. The truth is, though. 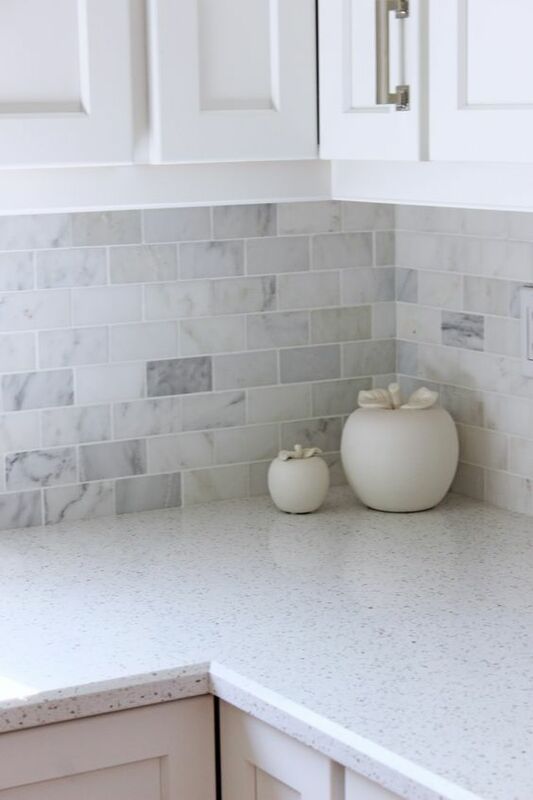 Even though we love quartz, there truly are a variety of countertop options out there so we figured we'd run through them with you. Sometimes it's nice to get a refresher on what's out there because even us as designers can get into a rut of using the same thing over and over again even though there are so many great options out there. The first and most common style of countertop is one that is either veined like a marble or flecked like a granite. Quartz has look-a-likes for both marble and quartz so we're really referring more to the style and less to the material. These styles work well in almost any home. They are classic. They can be nice in a traditional setting or warm up a more modern kitchen. Either way, it's the most common style and for many designers, a go to. There is life outside of countertop with movement, though! This particular style is actually our favorite and could be considered our go-to. White. Solid white. Even though this style looks a little more contemporary, we think it blends well with a lot of different styles as well. It goes a little more minimalist because it's clean and fresh but if we're being honest, pretty much anyone could benefit from all white countertops so we're not going to put it into a bubble. Something that's taking it's popularity back is the wood countertop. When rustic and shabby chic were all the rage, wood was everywhere. That style has since died but the wood portion has reinvented itself and is coming back for round 2. The thing about wood countertops is that it's warm. It makes a space, any space, feel comfortable and inviting and is usually received really well. It's a good option to mix with different countertop materials in a kitchen and works well by itself on an island. Definitely something to consider when re-modeling your kitchen! Also making a come-back are the dark countertops. Again, black granite used to be the big "modern look" in kitchens but that's not what's coming back. Dark countertop has reinvented itself in the form of slate or charcoal grey counters. These are often juxtaposed with white or light wood cabinets but they bring a certain elegance to any space. With the evolution of quartz color options you have a ton of varieties of grey to pick from and can make sure it's just the right shade! It used to be that granite was the big deal countertop. If a home had granite, buyers wanted it, builders charged upgrade fees for it, and everyone oohed and ahhed. While granite is still a great material to use for countertops, it's proven to require more up-keep than some homeowners want. Nothing against granite! I mean, it's a natural stone, so what do you expect? It's porous....without sealing and proper care, it's going to start to fade. The only thing is, it usually doesn't provide the impact of marble which also requires up-keep.... So you have a little less beauty with a little less up-keep. Eh....doesn't seem worth it...espeically for what builders charge you! It IS better than laminate or formica, but as far as we can tell...granite has sort of dropped low on the countertop material totem pole. The new number one is quartz. It's got all the benefit for all of the look. So today we're going to give you the run down of why quartz is worth it! For starters, quartz is man-made, and while many people used to turn their noses up at this factor, it comes with a lot of benefits. And even though it's man-made, it does contain natural stone so there is some natural beauty in it to appreciate. The natural material itself is quartzite and is actually mixed with other resins to create different quartz materials. Adding the resin itself makes the material extremely durable to heat, stains, scratches...pretty much anything a kitchen counter will come in contact with. I've had client rub soot on it, use brillo pads to try to scuff it up, and place hot pans directly on it but nothing affected it. Because of the man-made fillers, quartz isn't porous and won't absorb liquid like red sauce or oil. It doesn't get water spots and it doesn't need to be sealed every few years. Because it's man-made, the pattern in it is pretty consistent and while we are big fans of the great movement of natural stone, a consistent pattern countertop can also be a great thing especially in the more minimal designs we are seeing so much of now or in a kitchen with a big, patterned backsplash. Maybe you're just the type of person who likes the clean-look for their counters...then quartz is a great option for you! But it doesn't stop there. Because quartz has had increased popularity on the durability side, manufacturers are putting more money into developing different patterns and movement in quartz products. So now, you not only have the option of going completely solid but you can also get a quartz with all it's durability that actually looks like marble. The final benefit which may be the most important to you is that quartz has a pretty low carbon footprint. Even though it contains polymers and resins, it has low carbon emissions, and quartzite, the main product in quartz is available in abundance. Beyond that, you won't have to replace it or spend money maintaining it because it's so durable so you're investing in something that won't add to the landfills either. If it's not clear yet, we'll spell it out for you--we love quartz! It's a product we've been using for years that always leaves a satisfied customer. It may be a little more expensive than granite but it's worth every penny!